This bag does heavy rotation in my life. I’ve got at least a dozen of them. They are large and roomy so I can pack them full. But they are light so you are not carrying the weight of the bag as well as the contents. And it’s washable. What’s not to like? I’ve made them in plain colours and funky Stella Jean type prints like this one. Don’t you LOVE her designs? She is one of the most exciting designers in quite a while. 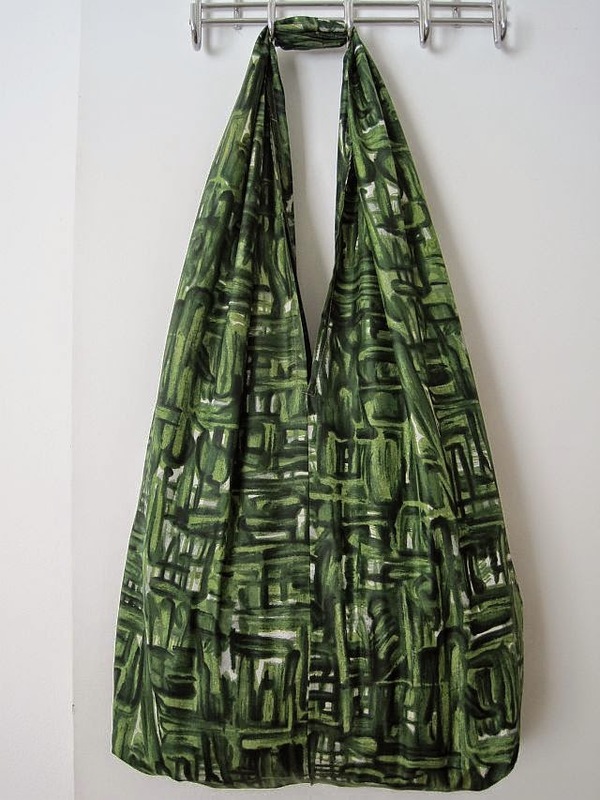 The pattern and sewing instructions are in this post – Slouchy Tote Bag FREE sewing pattern and tutorial. But I show the steps again in this post. First you need to make a pattern. See below for the pattern dimensions. I use local community newspapers that are routinely dropped in our mail box whether we want them or not. But be aware that the ink can transfer to your cloth. First cut your two matching bag pieces from your fabric. It doesn’t look like they will fit together at first but I promise they do. Sew halfway along sides starting at the same end as the notches. Now fold over so the seams lie on top of each other and notches are at each end and not on top of each other in the middle. Sew across bottom from one notch to the other. Fold notch flat and sew across it. You may have to over-lock or zig-zag the seams if your fabric is inclined to fray. Now sew two loose ends together which form the top of the bag that fits over your shoulder. Fold over and iron edges so they sit flat. Make a hem around the edges. Fold top in half and sew the ends together. Fold in half again. What you are doing is gathering up the voluminous fabric to make it much narrower and create a shoulder strap. You can see two more versions of this great bag – Grungy tie dye green and Jade green. Visit the Greenie Galleries at the beginning of this page for lots more FREE sewing patterns and DIY fashion ideas.